The past six months, with three trips to Europe, have given me the opportunity not only to experience roaming on European 3G wireless services but also the strategies and alternatives that allow me to minimize roaming charges while traveling with both a BlackBerry and iPhone. A key to the achieving this goal lies in the support available for WiFi access points in hotels, restaurants, airports and at conferences that provide robust, scalable WiFi support. But the question outstanding is why would I use both devices? The answer lies in the applications and content. While one can theorize academically about various low cost scenarios and one attempts to use WiFi wherever feasible, in actual travel, you need access to some form of wireless service wherever you may be. For instance, if lost in a city where you don’t speak the language, Google Maps can often help get you sorted out quickly. Or find the nearest restaurant district (was a big help in Paris, for instance). But you need wireless carrier access to use these services. So what measures can I recommend? The good news about these packages is that the per MB and per minute charges remain the same for any overage over the minimum expenditures. The bad news is that roaming charges are still “huge” compared to the $0.03/MB or approximately $0.10 per minute paid when on my home Rogers network. U.S.-based users should check with their “home” carriers to see if similar plans are available. Rule of thumb and current reality, however: roaming charges remain the last ultra-high margin service for wireless carriers. Second step: ensure you have installed both Skype and Truphone on your iPhone; you can then make voice calls from WiFi access points at prevailing Skype or Truphone rates. For instance, Skype-to-Skype calls are free while SkypeOut calls are based on using either a Skype Calling Plan subscription or Skype credits. Third step: buy, at a minimum, a Boingo Global Mobile plan; while WiFi in hotels and restaurants is usually free or has a daily charge, Boingo Global Mobile provides access in over 70 countries at airports and often at hotels where, otherwise, you would pay a daily fee that is usually more than Boingo Global Mobile’s monthly charge. BlackBerry Bold 9000: email (both BlackBerry email and GMail), BlackBerry Messenger 5.0, Google Maps, SocialScope – still the most comprehensive Twitter application on a smartphone; SlingPlayer Mobile for BlackBerry. Keep in mind that BlackBerry is overall more efficient for handling data due to the data compression provided by the BlackBerry Network Operations Centre architecture for managing data traffic. This ongoing wireless data compression feature is a major reason why I prefer BlackBerry for services such as Google Maps or downloading/uploading pictures in SocialScope as opposed to the iPhone when on a 3G wireless carrier network. 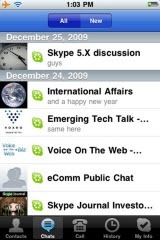 iPhone: main application is Skype, followed by Truphone. Very handy for making calls back to North America from hotel rooms or lobbies, restaurants as well as offices and conferences supported with WiFi access. (But you must have the relevant application open to receive calls and receive/send chat messages.) Other preferred applications include the Safari web browser (faster and more versatile than BlackBerry’s) and Facebook (which has a richer user experience than on BlackBerry) and a few applications that are unique to iPhone. Also comes in handy if the BlackBerry battery has died and I need immediate access to, say, GMail or a browser. Bottom line: the feature that continues to dominate my preference for BlackBerry over iPhone is the keyboard; it’s a real time two-way communications device whereas the iPhone, with its superior browser capability, continues to be an information delivery device but works best for one way communication. My use of its touch screen keyboard tends to be limited to entering user names and passwords. There’s one major application missing on the BlackBerry – with its full multi-tasking capability the BlackBerry is ideally suited for Skype as a VoIP client. One can have real time chat sessions continue in background while using other applications; we experienced this with iSkoot but at this point one would expect to have seen the Skype for BlackBerry that was announced by Skype around the time of last spring’s launch of Skype for iPhone. And now that Skype for Symbian beta supports both 3G and WiFi and the FCC is supporting for “net neutrality”, the “carrier-support” argument for avoiding VoIP clients over WiFi on the BlackBerry no longer holds water. In fact, Rogers has made it clear that they have no issue with running Skype over 3G networks. 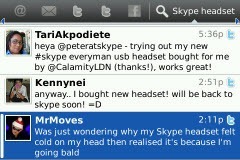 Let’s hope that Skype and RIM can get the act together such that we can see a product introduction early in 2010. I realize most smartphone users will only have one phone. I present this post simply to provide an overview of my experience using both these devices while optimizing my roaming experience when traveling out of the home country. I need to have both devices due to not only their popularity but also the different content exchanged and user experiences for each smartphone.